"SOS and R2K strongly condemn and see as unconstitutional the decisions taken by the SABC and ICASA on political advertisements. We believe that both institutions' credibility have been undermined by these decisions. We believe that the SABC and ICASA should uphold and actively promote the Constitutional principles of freedom of expression and access to information particularly during election periods to ensure informed citizens. We believe that the reasons put forward by the SABC's lawyers and upheld by ICASA to ban the Democratic Alliance's election advert showing a policeman firing a rubber bullet at an unarmed woman fundamentally undermine these principles. SOS and R2K hope that reason will prevail and that these arguments will be overturned in court." SOS and R2K note that the likelihood of the advert provoking or inciting people to take action against the police has already been disproved as no such conduct has resulted despite the broadcast of this footage on TV, radio and the internet. SOS and R2K note that this footage is already in the public domain. We believe that although the SABC's banning of the EFF advert is less of a cut and dried case given the EFF's call to "physically" oppose electronic tolling the SABC and ICASA have erred on the side of censorship. We believe that the regulations on political advertisements specifically, and political elections broadcasts more broadly, are constitutionally problematic, as the constitutional test is incitement to imminent violence, not “words which were likely to provoke or incite unlawful, illegal or criminal acts”. This is over-broad, and creates the space for the banning of robust but nonetheless important adverts such as the EFF’s. SOS and R2K believe that ICASA's conservative interpretation of the election regulations sets a worrying precedent for all future decisions around party political advertising. We believe that both ICASA and the SABC must be guided by the Constitutional limitations to freedom of expression that include incitement to imminent violence or hate speech. 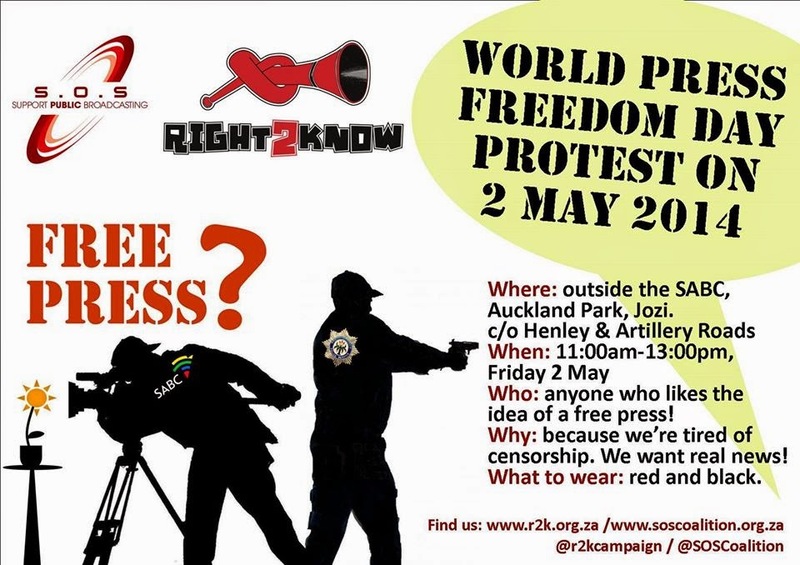 Join us at our Press Freedom Protest on the eve of Press Freedom Day on Friday 2 May 2014 where we demand: Stop our media being gagged and bound!